DP: What's your educational/technical background? Steve Woita: I've got my degree in electronic engineering. I did hardware engineering /technician work at Apple Computer back in 1980 to 1982. While I was there I was working on a game in my spare time called OctAgun for the Apple II. I learned from some of the best graphics programmers around: Bill Budge, Andy Hertzfeld, and Keith “Keithen” Hayenga. 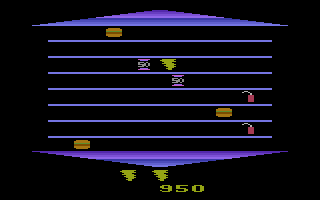 The big deal back then was getting objects to move around on the Apple II without flicker and doing it fast. Since the old Apple II had no consistent way of sending the programmer a video sync signal that said, "hey, the screens done drawing", we had to do tricks like use an XORing mask for just updating the edges of a bit map image. That way you couldn't see any flicker and you didn't have to update a back buffer, so the drawing speed worked out very well as long as you didn't have too many objects to update in a game tick. DP: When did you start at Atari? 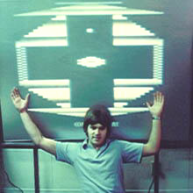 Steve Woita: I started Atari around 1982 and left 1984. I interviewed with Rob Zdybel, and I think I spoke with Dan Hitchens. The guy who hired me was Don Teiser. Rob saw what I was working on for the Apple (a 3D shooter) and gave the ok to hire me. DP: I understand you worked with Jerome Domurat on your first game, TAZ. Did he do the title screen? 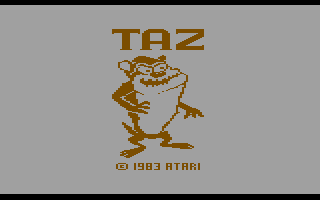 Steve Woita: Yes, Jerome did the title screen for TAZ. He thought it wasn't right to have his name on the graphic credits because I did all of the other graphics in the game, but he helped me and he deserved the credit too. DP: Did any other programmers help out with your games? Steve Woita: Not on the Atari 2600 games. I mean we'd share knowledge and snippets of code, but in general it was a one-man show. I miss doing the whole game. I'm back to doing that right now with Shockwave, Flash, and Java. DP: I've seen a prototype of this with the title written as TAZZ. Was the title change the only difference? Why was it changed? Steve Woita: I wanted to have a short name for the game, so I came up with TAZZ. 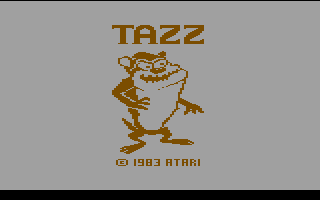 At this time the name TAZ was never used before. A guy from Warner Bros. came by and we talked about the name of the game, & he said, “How 'bout we drop one of the 'Z's?” and I said no problem. That's how the name “TAZ” was born for all the products you see now that are out there. DP: A few years ago you revealed how to uncover your name in the game. I noticed with Asterix (the “Euro” version of TAZ), you took your name out of it. Why? Steve Woita: It's been so long, I forgot what I did. I guess I'll have to try playing it again. I know that at the time, if Atari found out anything later that was in the game that they didn't approve of, they wouldn’t give us our bonus.... or that was the rumor at the time, so I may have opted to leave the Easter eggs out. DP: Is it true that you were going to quit if Atari didn't put your name on the back of the box? Steve Woita: Yes, this is true. I truly admired the way Activision branded their games with who actually did the work. That way, if you liked the way a certain designer did their games, you could easily follow their work and decide whether to buy their next game or not. You wouldn't buy a music record or CD if it said, "Hip Rock tunes from Warner Bros.", would you? Of course not. You'd like to know what band made the tunes. DP: I heard only about 10,000 copies of Quadrun were ever produced - is this correct? Steve Woita: That's correct. When we focus-tested the game, it tested too hard. The focus group consisted of mainly of 10 to 12-year-old girls. I have no idea why our marketing department used this demographic - it was a shooting game. I stressed so hard that we must do another test with the correct demographic, but the cost would've been too high. The girls kept saying, "It's not like Ms. Pac-Man". So, armed with this brilliant information, our marketing gurus figured the game was just too hard and it should be used as one of the featured games for the “Video Olympics”. The Video Olympics consisted of Quadrun, Gravitar, and Battlezone. DP: In another interview I found, you mentioned that it took you and another programmer a whole day to do the voice for this. Do you remember his name? Steve Woita: His name was Frank Hausman. He set up the recording stuff and we kept at the recording of my voice until we got my "QuadRun, QuadRun, QuadRun" voice down to around 700 bytes. I put the sound driver in and fiddled with stuff for a while to get the whole thing working. I had to shut the whole video display off to get enough 6502 horsepower to process my goofy voice. I figured the best place to put this voice stuff was between rounds just before I put up the 6 char kernel that displayed the name of the alien you were going up against next. DP: Supposedly there was to be a final playoff at the 84 Olympics, for Atari's Video Game Masters competition. Do you recall if this ever happened, or who won with Quadrun? Steve Woita: I heard that it did happen, but I don't know who won though. DP: I’m surprised Garfield was never released, as it seems fairly complete. Was it? Steve Woita: Garfield was going to use 16k and there were going to be hundreds of screens, probably more than Pitfall. I was about 1/3 of the way done with it when the "T" brothers bought (and ruined) the company. If only Atari didn't get sold, I would've finished the game in about 3 more months! DP: Did you have a graphics artist helping with this one as well? Steve Woita: Another artist, Mimi Nyden, helped on drawing Garfield, Odie and Nermal, and I did the rest of the game art. I did the whole game design by myself and Jim Davis told me to do whatever I wanted to do; I didn't report to anyone back then. The project was my own solo project. I did all of the sound, game design, programming and 95% of the in-game art. By the way, the goal of the game that I made up was that Garfield was baby-sitting Nermal and Nermal gets away and Garfield's job is to catch up to him. DP: I also noticed that it has your trademark graphics display- was there a reason you used that in all your games? Steve Woita: I just liked framing the games with a consistent trademark. I wanted to have a common visual theme in the games that I did for Atari. That's why you see what I called "cooking woks" on the top and bottom of all my games. It’s sort of a signature, so people could tell whose game it was if they cared. DP: Other than Garfield, were there any other titles you worked on that didn't get finished or released? 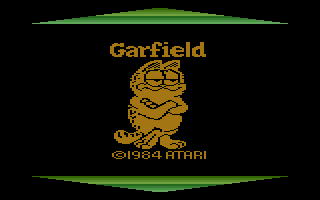 Steve Woita: There was one game that I started to work on for about 2 weeks just before we sealed the Garfield deal with Jim Davis, but I didn't even have a name for it yet. I usually find a name for the game before I start it. That helps me get more excited about doing the game. DP: Do any of your other games contain your name or hidden messages? Steve Woita: Quadrun does, & I truly forgot how to do it! If you get to the end of TerraDacktel, you'll be fighting against my face, which will be spitting out stuff. DP: With your 2600 games, were there any features you would have like to added, or any known bugs or glitches that gave you trouble (or never got resolved)? Steve Woita: Well, I guess since so many people are making a big thing about Quadrun being the first commercially available game to do voice without an adapter, I would've tried to put some more voices in the game, but I liked the way it turned out. Quadrun was my first project at Atari, sort of a project to get to know the 2600 and I figured I could sort of make a game out of it. 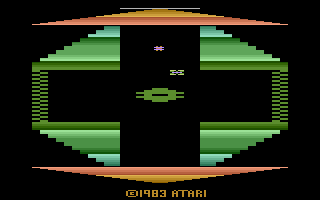 DP: Any memorable stories or anecdotes from your days at Atari? Steve Woita: I was working with Dan Hitchens on converting Battlezone to the Atari 2600. Dan was on vacation for a couple of weeks. We got some of the mountain stuff scrolling around in the background and a few other goodies going. When Dan got back from vacation I got to tell him the following story: "Hey Dan guess what, I was walking by Rich Frick's office and saw a completed version of Battlezone for the 2600!" Dan was not happy with this story. As it turns out, GCC was contracted 6 months or so before Dan and I were asked to do the conversion. I've never been a big fan of doing conversions and this was one of the big reasons why. DP: Why would Atari have you work on porting this if they already contracted GCC to do it? Lack of faith in GCC, perhaps? Steve Woita: I heard that our 2600 group really didn't know that GCC was working on this other version. We think that another part of Atari just didn't know (marketing) & contracted the game out to GCC. DP: I understand you worked with the Super Nintendo at MediaGenic. What was that like? Steve Woita: We worked on Shanghi for about a month only to find out MediaGenic sold the rights (or something like that) to another company to do the game. They (management) wanted us to work on Pitfall 3 (I forgot what the actual title was), so we worked on that for quite awhile, but I wanted to do my original idea, and as we were working on Pitfall, I got the feeling that my producer wanted me to do my original idea, so we dropped Pitfall and worked on my idea (I'm not saying what that idea was), I got laid off before we could finish it - the company moved to LA as Activison. DP: While at 3DO, you worked with Bob Smith on a few games. Did you guys know each other at Atari back then? Steve Woita: I've always heard about Bob Smith while I was at Atari, but never did meet him back then. The first time I met him was when he interviewed me at 3DO. During the interview I said to him, "Hold on, did you say your name was Bob Smith, as in Bob Smith the 2600 programmer?” “Yes, that's me!" He basically said to me, "Well, if you can program the 2600, the PSX should be no problem." and then he hired me. Bob's one of the best people you could ever know. He's one of the best managers I've ever worked with, and hope to work with him again soon. The titles I worked on with Bob Smith were: PSX Sarge's Heroes, Sarge's Heroes II and World War. DP: Were you involved with any other 3DO titles? Steve Woita: I also worked on WarJetz for the PSX II. I didn't do a whole lot on WarJetz, and left 3DO during this time because of an offer I couldn't refuse, to be the Director of Game Development at Design Reactor, which did online Shockwave and Flash games for some very, very big client sites (Disney, VH1, etc.) – one of their games was Udder Insanity. I carefully interviewed with this company for almost six months before we reached an agreement, as I was giving up a lot of stock and working with the best people in the business at 3DO. As it turned out, they had a business model that was less than stellar, but I can't blame them since the “dot.bomb” thing was going down. Needless to say, there was no need for me to direct their online game division any more, and now I'm back to writing my own goofy games. DP: I checked out your Java site the other night (very 'retro' cool). Dunk It is quite addictive (can't get past those damn sprinkles). I like some of the voice-over sound effects (such as the Mr. Bill-esque "Oh Noooo" in Antenna). TerraDacktel has a bit of that Joust feel to it. Who’s "Beyondo" Woita? Steve Woita: Beyondo is our cat ^..^ If you go to CoffeeBreakArcade you'll see a different version of TerraDacktel, where Terra's carrying one of the games that I worked on at 3DO (Ed: Steve's games are no longer on this site). 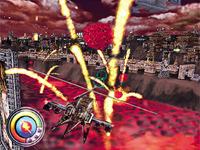 Coffee Break Arcade is one of the largest and best game sites around. This game site is truly the best online game site around. DP: How was it writing for the PS2? Steve Woita: In most cases you're writing to whatever game API (Application Programmer Interface) the company has chosen. In the case of 3DO, they made a HUGE mistake by not using Render Ware as the API of choice. This API was working way before our internal library team could get their act together. Our library team should have been telling us the do's and don'ts of Render Ware, and reporting back to the folks at Render Ware on what to fix or add. If 3DO would have used this pre-made API, we could have been to market with our first titles much sooner, and with much less frustration. It was a very costly mistake. 3DO is not a technology company - they're a publisher, and I just can't believe that we weren't able to just focus on making great games. DP: Besides at shows like Classic Gaming Expo, do you ever see any of your former Atari programmers? Steve Woita: Since I left 3DO, I don't see any of the old Atari programmers. Both Rob Zdybel and I are no longer at 3DO. I believe that Tod Frye, Howard Warshaw, and Bob Smith are still there. Both my wife (Susan) and I love the Classic Gaming Expo and we can't wait for the next one. Oh, by the way I guess I'll announce it here - I hope to be showing off and selling my new game for the PC called BigTime! at this year’s show. I'm trying to get back to basics on this game. The game puts me (yes, my goofy mug's in the game) against my own goofy boss monster designs. The story so far: The evil "OneTooth" character has taken over all of my Boss monster designs (he's driving these big creatures around) and it's the players job to defeat OneTooth and free up each inanimate object (Bosses). I must stress that this game is not 3D, it's 2D, and almost all of the artwork in the game is 1-bit! You see, all of the creatures that I've designed were done to look like the game is on a chalkboard in comic-book style (with the chalkboard being black and the chalk white) - hence the 1-bit art. I hope to have a demo up on Coffee Break Arcade soon. This would be a demo version of the game and the full version will have all of the levels and maybe more goodies, and the game price will be kept dirt-cheap. DP: What are some of your favorite games (for any format)?